To say that there are a few earthquake research centers in Southern California is a bit like saying that Chicago sits on a lake of some size. It's a bit of an obvious remark, but given that there are a number of such projects, it's important to take a look at some of the more compelling ones out there. 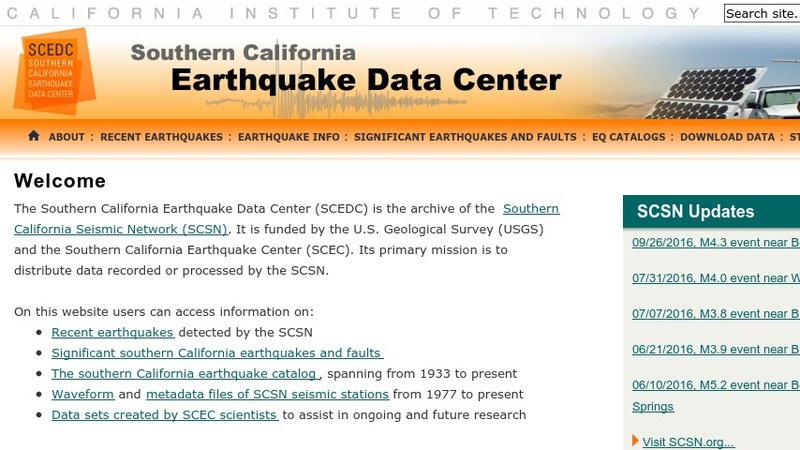 One such important resource is the Southern California Earthquake Data Center, sponsored by a host of organizations, including the California Institute of Technology and the United States Geological Survey. Visitors to the project site can peruse some of its recent work, which includes a clickable map of the region that features information on recent earthquakes in California and Nevada. Equally compelling is the clickable fault map of Southern California where visitors can learn about the local faults and recent activity along each fault. Another key element of the site is the historical earthquake database, which may be of interest to both the general public and those who are studying this area.